Annamarie has been practicing yoga for 5 years and instructing for the past 2. 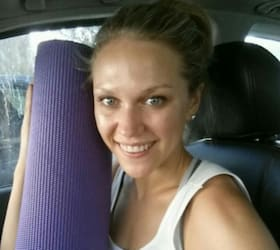 She began yoga after being injured in a car wreck. Her yoga journey continues to teach her acceptance of limitations and compassion for herself. Now she enjoys teaching others to become more aware of and listen to the body through mindful breath. Annamarie is also a psychologist at Southern Indiana Rehabilitation Hospital where she can further work to help people grow in their understanding of the body and mind.